Better management of your farm’s natural assets is about environmental as well as production and financial benefits. Farms are operating ecosystems, with everything interconnected. The healthier the natural assets, the better the production outcomes, the more sustainable the farming system, and the more enjoyable it is to live and work on the farm. Now that you have an inventory of your farm’s natural assets (procedure 5.1), make your farm a more attractive place to live and work by managing your farm’s natural assets for multiple benefits. Look for multiple benefits from any action, eg, perennial pastures sown to meet animal feed demand (see procedure 8.2 in Turn Pasture into Product) can also reduce salinity and soil erosion when sown in the right spot. Community resources are often available to fund environmental outcomes that benefit both your grazing enterprise and the community. Devise an action plan with explicit targets and descriptions based on your vision for the resource base. Prevent sheetwash and gully erosion by slowing water down, letting vegetation regenerate and groundcover build up. Re-establish riparian vegetation to filter and trap dissolved nutrients and slow water movement. Maintain existing structural works to slow or divert flows where riparian vegetation is in poor condition. Aim for 70% groundcover in flatter areas and 100% on slopes (see tool 6.2 in Healthy Soils). This requires management of how hard and long stock are allowed to graze areas. Feed budgeting (see tool 8.4 in Turn Pasture into Product) is a key tool to ensure sufficient pasture is available for livestock production, to determine the number of stock that should be placed in a paddock, and how long they can stay there and maintain groundcover. The signposts contain resources to help you achieve this. Trap eroded soil particles and reduce the bombardment of the soil surface. Stubble, plants, grass butts or small shrubs (higher than 10cm) that sit up into the air offer even more protection, so you will require slightly less cover. Shrubs and tussock grasses protect the soil when the spacing between the plants is less than three times their height, and when they are evenly distributed across the paddock. The signposts contain a number of useful resources on managing grazing and cropping paddocks in areas prone to wind erosion. Set targets for what priority areas will look like when you prevent erosion. An example target may be ‘maintain 1,000 kg DM/ha all year round’; or ‘gully walls stabilised’. Devise an action plan to achieve the targets for each area. Set a date for achieving these targets. Remember it is much easier to break a big issue into smaller, manageable chunks, or individual steps. Commit to monitoring the change (see procedure 5.4). Manage saline areas for production and to prevent further environmental decline. Large scale replanting of catchments to trees is unlikely. To increase water use by pastures and reduce water table recharge rates, use pasture plants which grow longer into the season and explore a greater volume of soil (deeper root systems). Provide the right soil conditions for growth (see procedure 7.1 in Grow More Pasture) to improve water use efficiency. Perennial pasture establishment can be expensive. However, perennial pastures on recharge areas can deliver multiple benefits to your farm by reducing additions to the water table and increasing pasture productivity. Devise an action plan to achieve the targets for the priority areas. Set a date for achieving these targets. Remember, it is much easier to break a big issue into smaller manageable steps. Saline soils are one of the ‘problem soils’ included in procedure 6.4 in Healthy Soils. Saline soils are included here because saline discharge sites are often associated with water quality problems, eg, salt wash-off into streams and increased erosion, and with the decline and death of native vegetation. Apply the guidelines in tool 5.5 to better manage any saline sites you identified on the farm. When managing native vegetation, there are two elements of overriding importance – extent (amount and degree of connection between patches) and condition. Now that you have assessed the condition of your native vegetation (see procedure 5.2), manage the vegetation according to its condition to achieve your vision for your grazing enterprise (see signposts in procedure 5.1). Bare ground benefits many weeds: manage grazing to minimise bare ground, but remember that the forbs and other small non-grass plants that contribute to the diversity in native pastures rely on some bare ground between the tussocks. Revegetate: while ‘revegetation’ is nominally the last resort, the reality on many properties is there is insufficient native vegetation to underpin a healthy farm ecosystem. Revegetation is most effective if it is used to enhance, enlarge or link existing patches of native vegetation. Natural regeneration is the cheapest and most effective, if there is a bank of seed of all the key species still in the soil. Seed banks will be very low on properties that have been extensively cleared for many years, slowing the pace of natural regeneration. Devise an action plan to achieve the targets for your priority areas. Set a date for achieving these targets. Remember, it is much easier to break a big issue into smaller manageable steps. Maintain native vegetation around water. While it is preferable to follow the suggestions about size, shape, structure and connectivity of vegetation, even small isolated patches of revegetation provide habitat for some native birds and lay a foundation for future birdscaping endeavours. Some model bird havens started out as barren and degraded landscapes. You’ve got to start somewhere. To successfully manage weeds, choose a diverse combination of weed control activities, targeting the weak points in weed lifecycles. The Diversity table in tool 5.3 will help you scope a range of methods for weed control, then choose the tools you can apply to manage the weeds to achieve the goals you identified using the Deliberation table (tool 5.3). Use the Diligence table in tool 5.3 to keep your weed management plan on track, and make sure you “do it on time, every time”. The CRC for Weed Management has described five ‘tactic’ groups of interventions (see tool 5.4), where you aim the particular intervention to the weak points in the weed’s armour. Tool 5.4 specifically focuses on weeds in native vegetation, but the principles stated have relevance to pasture weeds in general. Integrated Pest Management (IPM) is the increasingly popular system of managing insect pests by monitoring populations, replacing broad-spectrum insecticides that kill pests and beneficial insects alike with more selective insecticides and using other strategies like baiting and seed dressings. Farmers who have tested an IPM approach have reduced their reliance on broad acre spraying with direct savings of between $5/ha and $30/ha (see signposts). Time spent spraying is often replaced with regular monitoring of paddocks. A new level of skill is required to identify the beneficial insects as well as the pests and to know the appropriate strategies to apply. Farmers who have tried an IPM approach say holding your nerve and waiting for the beneficial insects to do their job is the most difficult part. Applying pesticides at the appropriate time and location. For RLEM, TIMERITE® predicts the optimal date for spraying in spring to minimise insecticide use and to maximise effectiveness (see signposts). Review the rabbit control measures analysed in tool 5.6 and use a combination of these. In order of cost effectiveness, poisoning, warren ripping and fumigation are likely to be the most important primary control methods. With rabbits, it’s a matter of persistence. Devise an action plan to achieve the rabbit control targets in priority areas. Set a date for achieving these targets. Remember, it is much easier to break a big issue into smaller ‘manageable chunks’, or individual steps. There are a range of control measures for foxes (see tool 5.7), and as for rabbit control, it is often best to use a combination. Foxes are highly mobile so without a coordinated effort with your neighbours, control programs are unlikely to have a lasting impact. Concentrate baiting efforts in March and August/September each year. Around August/September is when mating season has finished and vixens are actively seeking additional food prior to whelping. Also at this time of the year the fox population is at its lowest. In March, juvenile foxes disperse to find their own territory, displacing older foxes. Well placed baits will be readily taken in March. This concentrated, twice yearly baiting slows the recovery of the fox population, as foxes breed only once a year. Many farms with or near large areas of bushland face significant grazing competition from native animals, especially kangaroos and wallabies. In most cases, these are native animals that have benefited considerably from the creation of extensive grasslands and watering points for sheep and cattle and are often present in greatly increased numbers. Control of native animals often faces strong community resistance. It is not possible to provide best practice guidelines here because what is appropriate in one jurisdiction can be illegal in another. In most states, sheep producers can obtain permits to cull if certain native animals are causing damage or economic hardship. In extensive grazing areas, culling is the only viable control method. In more intensive grazing areas where competition from native browsers is high, exclusion fencing can be viable. Local advice is essential, as the type of fencing required varies depending on the animals to be excluded. Risk of stock losses or stock straying into neighbouring properties. Water access points that restrict stock to a limited number of sites, and can involve ‘strengthening’ the access point with concrete, gravel or logs to minimise pugging. The best water access points have the same basic features as crossing points but they also have minimal shade or shelter to discourage stock from remaining in the area other than to drink. 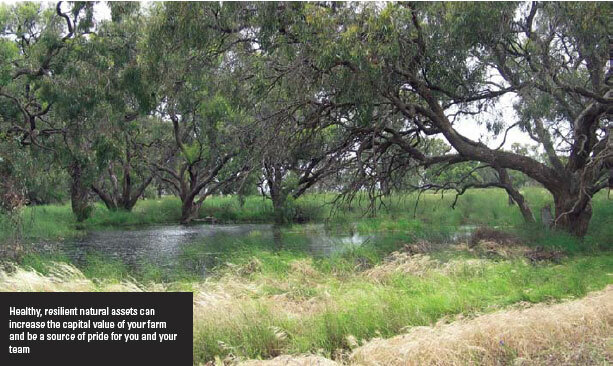 Use the Land & Water Australia booklet, “Stock and Waterways: a manager’s guide” (see signposts) to develop a strategy to manage riparian land productively and sustainably. A shade structure over troughs will limit algal growth, reduce evaporation and keep the water cool, but must be kept to a minimum size to discourage camping. Some farm dams are ideal candidates for the concept of multiple benefits. Good design and management of farm dams and the surrounding vegetation can protect your farm dam, improve water quality and water yield and increase the value of the dam and surrounds for wildlife habitat. Most farms have one or two dams that can provide excellent habitat for a range of wildlife like birds, frogs, mammals and fish. Restrict stock access to let vegetation establish around the dam. Consider limiting stock to a controlled watering area, or providing a reticulated supply. Stock access to some parts of the dam will benefit birds (like swans and ducks) that prefer open space beside water. Good groundcover in the dam catchment (not applicable to roaded catchments) will improve water quality by reducing soil, nutrient and faecal contamination and sedimentation. Shelterbelts provide shade and can reduce evaporation from the dam’s surface. Reduce wave action with strategic placement of islands and surrounding vegetation, and allow taller reeds and sedges in parts of the dam. Another simple (but potentially expensive) way to increase wildlife habitat is to construct a dam island. Add vegetation or dead branches to provide nesting and roosting sites for waterbirds on the island. Next time a dam has to be cleaned out, include an island or a vegetated buffer zone in the new design. Review the range of options for reducing greenhouse gas emissions from your farm using the FarmGAS calculator (see signposts in procedure 5.2). Offset livestock emissions by storing more carbon in the landscape. The key to reducing livestock emissions is to maximise their growth rates and convert as much of their energy intake as possible into meat and fibre. This can also increase profit. Australian Sheep Breeding Values (ASBVs) for yearling liveweight (YWT) are positively correlated with daily methane production. Selective breeding (see procedure 9.1 in Gain from Genetics), improved feed management (see procedure 8.2 in Turn Pasture into Product), maximising animal health (see procedure 11.2 in Healthy and Contented Sheep) and improving livestock genetics (see procedure 9.2 in Gain from Genetics) are essential to the future profitability and sustainability of the livestock industry and the environment. Organic carbon stored in soil is a significant carbon sink, and is increasingly recognized in strategies to mitigate climate change. Soil can store around 50-300 tonnes C per ha, equivalent to 180-1100 t CO2. Pastures and crops store 2-20 tonnes C per ha, while plantation forests can store up to 250 tonnes C per ha. Maintain groundcover (see procedure 6.2 in Healthy Soils) to minimise erosion losses, maximise organic input to soil, and offset methane emissions from your sheep enterprise. Inclusion of soil carbon management in any future carbon reduction scheme will rely on the development of costeffective methods for estimating soil C change under changed land management practices. On-farm water reticulation guide: practical, technical advice to help sheep producers plan, design and install piped systems. Order a hard copy from: www.gwmwater.org.au, or click here to download. Greening Australia – Visit: www.greeningaustralia.org.au and select publications. TIMERITE®: a reliable and effective option for control of redlegged earth mites (RLEM) on your farm. Visit the AWI website at www.wool.com and search for Timerite. Grain & Graze Integrated Pest Management: recent results show IPM systems can increase biodiversity on mixed farming enterprises and reduce the environmental impact of the business. 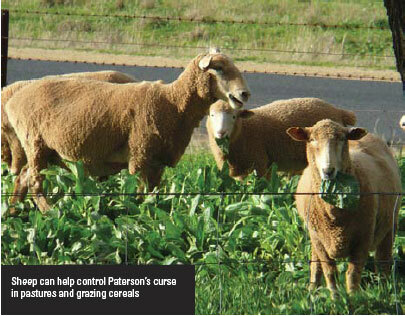 Download the Grain & Graze Integrated Pest Management brochure here. MLA Tips & Tools: a range of publications area available covering weed management, NRM, grazing management, native pastures, soil health, deep drainage, groundcover. Regional NRM Authorities: critical links for natural resource management and funding – for access to all regional NRM Authorities across Australia go to www.nrm.gov.au/regional/regional-nrm-organisations . Australian primary industries transforming for a changing climate: the CSIRO Climate Adaptation Flagship is working to understand how primary industry businesses, communities and sectors can transform their practices to adapt to climate change. Visit: www.csiro.au and search for Climate Adaptation Flagship. Greenhouse gas abatement and feed efficiency: the latest findings from Sheep CRC research into tools to help sheep producers manage greenhouse gas emissions from sheep. Visit: http://www.livestocklibrary.com.au/search and search for Sheep CRC, select Project Unpublished Reports, then Project 1.4.